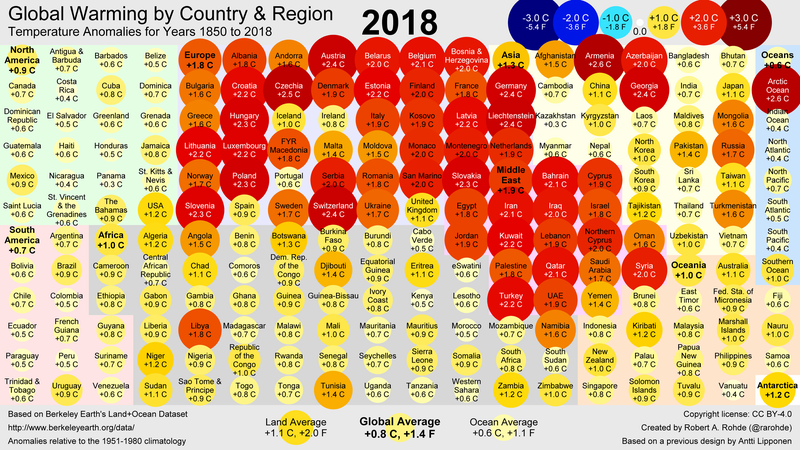 A country-by-country annual temperature analysis for 2018. Earth capped its fourth-warmest year in human history in 2018, and this year will almost certainly be hotter according to a newly-released analysis. The analysis comes from Berkeley Earth, an independent group of scientists, and specifically shows the world was 1.4 degrees Fahrenheit (0.77 degrees Celsius) warmer than the 1951-80 average. NASA uses the same baseline. The analysis doesn’t include December data thanks to Trump’s shutdown, which continues to wreak havoc on science. But 2018 is so much warmer than fifth-place 2010 that the rankings are unlikely to change. Berkeley Earth’s ranking also lines up with predictions put together by NASA climate scientist Gavin Schmidt back in October. The top four warmest years have all occurred in the last four years. Basically, climate change has made these types of freakishly warm years our life now, and it’s only a question of how much other natural climate patterns will determine where the records fall. And one of those natural climate patterns is likely to provide a burst of heat for 2019. El Niño has been in a will-it-or-won’t it phase for months. The climate phenomenon, characterized by warming in the eastern tropical Pacific, tends to give the global average annual temperature a boost by releasing heat from the ocean. Scientists were already expecting it to lift 2019 into near-record warm territory, and the Berkeley Earth analysis underscores that. This year is already off to a sweltering start in some locales. Australia continues to roast under a major heat wave and large chunks of Africa and Asia are much warmer than normal right now. Berkeley Earth’s temperature analysis is one of a number of records kept around the world. Most are updated by national meteorological services and their annual updates are released around now, and all rely on satellite as well as on-the-ground data to inform their work. In the U.S., NASA as well as the National Oceanic and Atmospheric Administration both keep a record, but the shutdown has kept them from releasing their 2018 analysis much to the chagrin of global annual average temperatures stans. When the shutdown finally ends and the analyses come out, they’ll likely be pretty close to what Berkeley Earth says, which is not great news.